Explanation: What would it be like to walk across Mars? The robot Opportunity rover is currently experiencing what it is like to roll across part of the red planet. 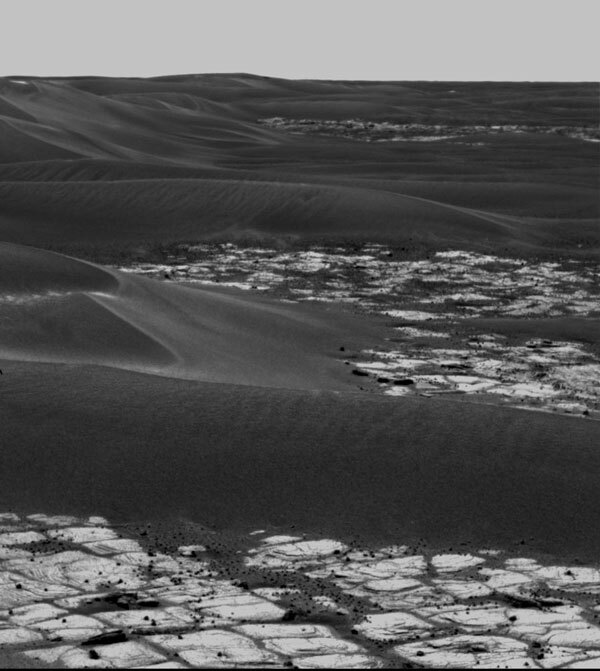 It's not always easy -- the rover is being instructed to dodge the deeper drifts of dark sand. During its exploration of Erebus Crater, the rover stopped and took the above picture. Inside this part of Erebus Crater, the surface of mars is covered not only by dark sand but also light outcrops of rock. Scattered across the exposed rock are numerous small round pebbles known as blueberries . Typically smaller than marbles, these unexpected and unusual rocks likely formed by accretion in an ancient wet environment. Also visible are some strange protruding edges known as razorbacks. The above image was taken early last month.